The season starts tomorrow. Ok, that’s not fair, the Tour Down Under was its usual uninspiring self, but I’ve enjoyed watching Boonen and Cavendish in Qatar and Oman, and Nibali’s ride up Green Mountain has me itching to see what he’ll be up to in the bigger stage races. Still and all, cycling doesn’t feel like cycling without crowds, competitive stars and Europop, and all the early season races have missed at least one of those elements. Tomorrow we get Omloop Het Niuewsblad, or Het Volk to anyone with a long memory or a clumsy tongue. It’s the first classic of the season, or semi-classic if you want to be picky. It happens in Flanders, therefore it will have insane piss-addled crowds and a creaking truckload of Europop. Best of all, it will have competition between big name racers. The last five editions have been won by Sebastien Langeveld, Juan Antonio Flecha, Thor Hushovd, Philippe Gilbert and Filippo Pozzato, and strong teams and riders abound this year. Omega-Pharma Quickstep will be sending Tom Boonen, Sylvain Chavanel and Gerald Ciolek. 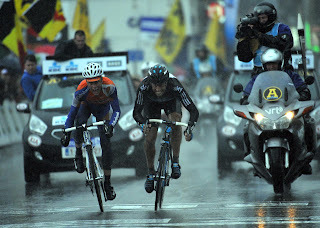 In addition to past winners Hushovd and Gilbert, BMC will be giving Taylor Phinney his first taste of a Belgian classic. Poor old Edvald Boasson Hagen has got a dicky tummy, so Sky have benched him, but their team does include Flecha with strong support from Chris Sutton, Ian Stannard, Bernard Eisel, and Alex Dowsett, among others. Green Edge will be led by Sebastien Langeveld and Baden Cooke. Unlike his previous wins after short-notice participation, Philippe Gilbert has specifically targeted the race this year, and wants to become a three time winner. Normally, if Gilbert wants to win something there’s little point in anyone else turning up, but Boonen and Ciolek have both shown good form already this year, and Sky’s team is packed with strong riders to help Flecha back to the top of the podium after last year’s second place. It’s a competitive list of riders. The route itself shows that traditional Flandrian disregard for riders with panache in favour of bulky hardcases. Climbs include the Tenbosse, Eikenmolen, Leberg and Molenberg, not to mention Boonen favourite the Taaineberg.On top of that, there are numerous stretches of power-disrupting cobbles. While the hills will be familiar to anyone who watches the more illustrious Ronde van Vlandeeren, Omloop Het Niuewsblad isn’t necessarily won by making an attack stick on those jaw-droppingly cruel gradients. With most of the climbing concentrated in the middle third of the race the hills tend to be selective rather than decisive, and those who find themselves still in contention after the climbing will find that there are still 20 kilometres and two sections of leg-sapping cobbles to go. For fans, Omloop Het Nieuwsblad can be a murky eyeful. It takes place in a muddy part of the country, in a rainy part of the world, and at a time of year when the sun can often be setting by the time the riders come in to the finish. If your image of cycling is of the Tour de France’s bright fields of sunflowers then Het Niuewsblad can look like a post-apocalyptic vision, as riders emerge from gloom, down greying streets, soaked in rain and liberally plastered with a cocktail of chalk, mud and cowshit known among riders as ‘Belgian Toothpaste’, moodily backlit by the headlights of their team cars. Personally, I’ve got a lot of room in my life for races that can paint such an evocative picture at a single glance. As for the winner, I’m going with Tom Boonen. I know, it’s foolish to bet against Gilbert, and I’m aware that Boonen usually slumps after the season openers, but I’ve got a good feeling about him this year. I’ve already seen him splinter the peloton, chase down Cancellara, and win a couple of sprints. I reckon he might finally be back on his old form, and he's capable of marking attacks, making an escape, or winning from a bunch.